So excited that I'm blogging this week. Following the overwhelming success of the festival, now in its third year, Nigerian media mogul Nduka Obaigbena is taking his brain-child cross-continent with scheduled events in Abuja, July 11, Lagos, July 13, Washington DC, August 1, and London, October 14. The world-class festival is set to project positive images of Africa by showcasing the renaissance of Africa's music, fashion and the arts. Featured artists at this year's events will include Jay-Z, Usher, Mary J. Blige, Chris Brown, Rihanna, Fat Joe, Naomi Campbell, Oluchi, Tyson Beckford, Youssou N'Dour, Liya Kebede, Alek Wek, Ozwald Boateng, Chris Aire, 9ICE and Shank. Here is Nduka Obaigbena along with supermodel, Naomi Campbell & designer, Ozwald Boateng at the photocall at Royal Albert Hall in London. The Deaf Orphans Educational Trust is a NON-Governmental organisation whose aim is to provide quality education and life skills to deaf orphans. On the 20th Of June, The Deaf Orphans Educational Trust together with CatWALK THE WORLD and The Malawian Embassy hosted an event to raise awareness about Deaf orphans in Africa and especially Malawi. Here are the photos. Fashion for a great cause! Oluchi at NEAs & Yinka Davies at Kora Event both looking great in similar embellished strap dresses. I cant even ask who 'rocked it best' cause they both look fabulous. wish i was going home this summer! Nice! Kudos to Mr. Obaigbena, And the ppl behind the Deaf orphans NGO. 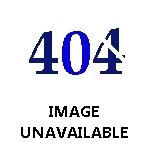 Ozwald looks scrumptious. I really admire it when people in 'seemingly frivolous' business help people. Sorry but that ThisDay festival sounds like a logistical nightmare. I have much more to say, but I'll keep it to myself, but my girl crush is Naomi Campbell, receeding hairline and all, I absolutely heart her. Bella how do I email you a site? Thanks. Moments like these make you so proud to be Nigerian...African, people looking to do something for a just cause, something positive. As for ThisDay, thank God, I will be rocking it in D.C yup!!!! I really look forward to watching Jay-Z again.He was the man of the 2006 festival.Thanks This Day. 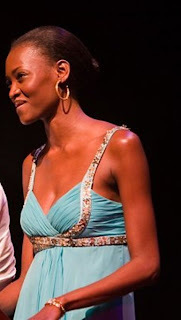 I agree with you but being my spokes person Oluchi rocked it harder and her hair healthy. Thanks to Natures Gentle Touch. Can you please post more info on This Day event that will be in DC? i.e. tickets, venue etc when the details are disclosed or if anyone knows, please share. Una get one thousand dollars to see Jigga? Na to on BET dey respect ya sef ooo!. Can we please discuss the fineness that is Oswald Botang. My God, that man is perfection. Ghana makes goodlooking men eh. Oh yea, I love Naomi too. kpakpando, I hope Oluchi takes heed and rests her real hair from the weave now and then. her boobies filled it out better...dat said i luv me some oluchi anytime! my comment was posted thrice??? dang! loved the dress better on Yinka, Oluchi looked a bit too slim in hers. 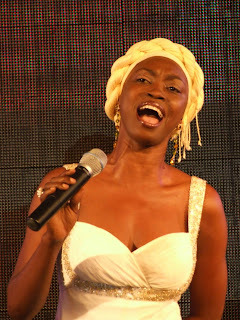 I think I prefer Yinka's but I thought she kinda looks like Kate Henshaw-Nutall (sp). I'm not enjoying the blue on Oluchi. i'm with adeyara on this one. how you gonna do a show to promote african music and have more african-american singers perform? This was really intresting to see nice stuff really. i really f with this blog. even though i feel like it's more for women. and that f is the shortened version of the profane word. because i see that disclaimer. but keep on rocking it. and let people know what's good in nigeria and on that whole continent. yzr. Talking of fashion, Bella did you hear Tiffany Amber's (folake Coker) got kidnapped last week for a ransom of N50million? So you can no longer be safe and successful in Nigeria now? Wow! Talking of fashion, Bella did you hear Tiffany Amber's (Folake Coker) CHILDREN got kidnapped last week for a ransom of N50million? So you can no longer be safe and successful in Nigeria now? Wow!